I am a book lover. I love being surrounded by stacks and stacks of books, both read and unread. I adore walking into someone’s home and scanning their bookshelves, and get giddy when I see familiar titles. I carry at least one – if not two (just in case, you know) – books with me everywhere I go. I typically read at least two titles at once – a novel, an inspirational morning book, and some sort of writing guide. I collect books like some people collect records (wait – does anyone DO that anymore?) and update my Goodreads profile like a pro. My Amazon wish list is full of…books. That’s about it. And I LOVE to gift books – in fact, this year my mom’s present was a HUGE bag of books that made her as excited to receive as it felt to give. She reads more than I do! In 2015 I set my reading challenge too high, and missed it by about 13 titles. I did manage to complete at least 27 full-length novels, which I consider pretty satisfactory considering I have over 100 English students in class this year (think – 100 papers per assignment, at least 5-10 minutes to read/grade each, totaling 500 minutes which is OVER 8 HOURS minimum!). This year I’m sharing my favorite books, only because I want to share just the very best. I’ve added links to make it easy to read more about these titles on Amazon; I’d love to know if you agree with me – and if you’ve read something you think I should add to my list, be sure to comment. I’m always on the look out for great stories. I read more historical fiction than any other genre, and this was one of my favorites. The main character, Sarah Brown, is the daughter of abolitionist John Brown, and embraces the cause of the Underground Railroad all on her own. The author weaves a parallel story set in current time about a woman struggling with infertility who finds a mysterious porcelain doll head in her root cellar. I loved the mingling of past with present, and the ideas that women throughout history have challenged themselves to create the life they really desire. I tried to write my own bit of family history after reading this book – you can get the story of my great, great grandfather in my blog post, “Sheep Shearer’s Children In Lake Tahoe”. Pulitzer Prize winner. Besides that, this story is a glorious, delicate and beautiful tale about a blind French girl and a German boy who are trying to survive World War 2 in France. It’s a long read (530 pages), but I guarantee you will be captivated by the author’s ability to weave together two characters who should never have met, all the while sharing the idea that despite our circumstances, people really do try to be good to each other. Another historical fiction story set in parallel structure, The House Girl tells the stories of Josephine Bell, a seventeen-year-old slave living in Virginia, 1852, and Lina Sparrow, a young lawyer living in New York City, 2004, who is tasked with research into a class-action lawsuit surrounding a mysterious Civil War era artist. I loved the interplay of art and history and secrets, and the idea about what does justice really look like. This book was deliciously creepy, telling the story of a young boy named Will who had never been allowed to go outside. So what does he do? He defies his mother, sneaks out (wearing a protective helmet, just in case) and finds a kid who shows him the joy of skateboarding. There’s a mystery that happens, too – but this story showed me the extremes that parents will go to to protect their children, and the dark side of not allowing kids to experience life on their own. You can read my blog post, “Living In Between Love and Fear”, inspired by this book. After reading this first book in a series, I am now completely hooked on Jane Kirkpatrick. All Together In One Place shares the story of life during the westward movement in the U.S., a time when women were forced to pick up, move, and follow their husband to someplace they had never seen. What made this one of my favorite books was the multitude of strong female characters – women so strong they outlasted most of the men and managed to create their own destiny along the way. I loved discovering this writer – another woman tackling the issues of feminism as told through the story of Mary Sutter, a Civil War era midwife who battles prejudice and discrimination against women. This was one of my favorite books because while the depictions of medical treatments of the time could be a bit hard to stomach, the courage and fortitude of Mary captivated me. I couldn’t put this one down. To my surprise, I wound up meeting this author during a conference at BlogHer this summer in NYC, and she was as lovely and delightful as her novel. While this wasn’t historical fiction ( the story is set in current day Chicago), her themes and story line most definitely have been repeated throughout our country’s history. Her story of Rachel, a biracial girl who survives a family tragedy, made me really stop and think about racism in our country, and how we all contribute to the ideas of social justice, and the power beauty and race hold in our world. OK- true confession – I’m sharing this title as one of my favorite books of 2015 because this collection of short stories is where I first became a published author in print. My story, “The Ride of a Lifetime”, was selected to be published by Story Shelter in their first ever print edition. To say I was over the moon is an understatement; after decades of seeing other author’s names on the title page, I did do a happy dance to see my very own there in black and white. I Am Here is an interesting collection of real life stories of regular people who have had extraordinary experiences – and my tale of our first trip to Nicaragua fit right into their theme. Do you see anything you’d like to read in 2016? Do you share my love for any of these titles or authors? I’d love to hear your thoughts – please comment and let’s create another amazing year full of books! P.S. – Too late for making my list, but I’m about to finish A Window Opens by Elisabeth Egan. This title came to me via a friend’s blog A Design So Vast – Lindsey’s post about “Best Books of the Half-Year” is full of interesting titles. It’s fun to stray away from my usual genre to dump myself inside the life of another modern woman determined to balance motherhood, career and marriage. If you’re interested in my past year-end book posts, you can find my 2013 recommendations here, and my 2014 favorites here. I’ve also written a “Books I Love” post here. Just ordered The House Girl from the library. Thank you! Just finished THE GOOD GIRL. I hope you love The House Girl…and I’ll check out The Good Girl with your recommendation. Thanks, and happy new year, friend. Great list! Thanks for sharing. The ones I would add: Kristin Hannah’s The Nightingale, Did You Ever Have A Family (Bill Clegg), and The Life We Bury by Allen Eskens. I also fell in love with Fredrik Backman’s writing and characters in A Man Called Ove and My Grandmother Asked Me to Tell You She’s Sorry. Both are great books and are particularly fun to listen to and read with the Audible component. Susan, thank you very much for the recommendations! The Nightingale has been on my to-read ist – the others you mentioned I’ll be adding to my list today. 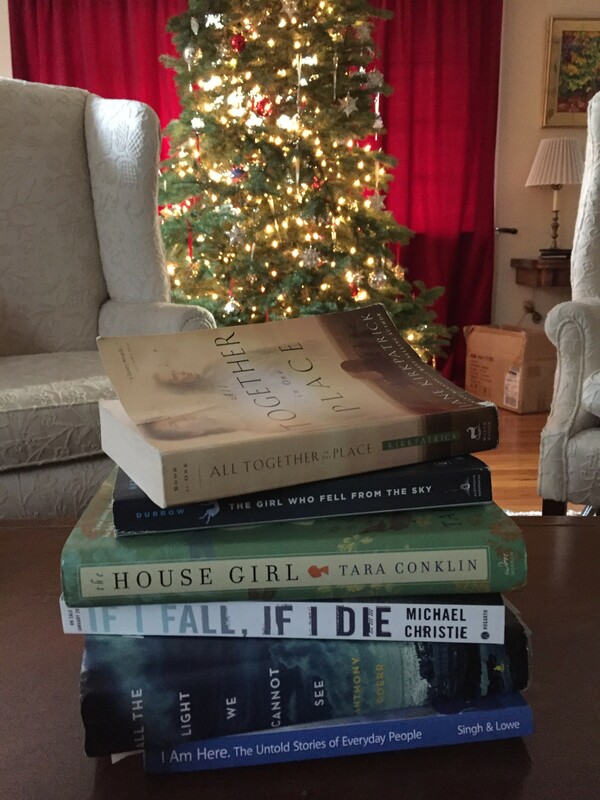 Happy reading in 2016! Love this! I have been wanting to read the light we cannot see forever..
Oh, I hope you love it as much as I did! Let me know…and thanks for commenting today. Happy New Year! This is great! Love seeing what other people are reading and loving. Thanks Nina! I love reading other people’s book posts as well- I always get cool recommendations. What are you reading now? If you like longer books and historical fiction, try The Luminaries–takes places during New Zealand’s Gold Rush, which is never heard about. I was hooked from the beginning, when the protagonist finds himself walking into a secret meeting of very disparate men who all have their own secrets. Happy reading! Laurie, thanks for the recommendation. I’ve heard of that book, and yes – I love historical fiction! I’ll put it on my list. Thank you!